Is it worth your time to reduce electricity usage? Common sense would say yes, but what does that really equate to in real dollars? Where’s the best bang for the buck? More importantly how would I really know how much I’m saving? 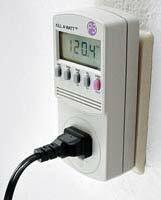 On the recommendation of a friend I recently purchased a P3 International P4400 Kill A Watt Electricity Usage Monitor from Amazon.com. The device is very simple you plug it into an outlet and then you plug anything that you want to monitor into the Kill A Watt and you can see Voltage, Amperage, Watts, and Kilowatt Hours over time. It’s remarkably easy to use, and in mere seconds you can see the wattage use of anything you can plug into the Kill A Watt as long as it draws less than 15 amps which should be most everything except say your dryer, hopefully you also realize that super huge plug won’t fit in the Kill A Watt. It does not take a hacker with elite skillz to operate the Kill A Watt, if you can plug in an electrical cord and push a button you can get usable data. There are really two ways to get the energy usage of your devices: output the wattage use of the device and calculate Kilowatt Hours or you can leave the Kill A Watt plugged in and let it monitor the electricity usage for the duration of the items operation. The latter is useful for something that may cycle through different levels of electricity use like say your refrigerator. This is the simplest method for determining electricity usage if you’ve got the time. “I was told there would be no math.” Plug in the Kill A Watt then plug in your device. Push the KWH/Hour button and it will start to display the KWH/Hour usage starting from the time the Kill A Watt was plugged in. Simply let your device run through a cycle for such things as a washing machine or for a time period. When that period is done record the KWH/Hour usage. Arggh this is horrible there’s got to be an easier way! Sure, head over to WolframAlpha.com. Let’s assume we have a device that uses 30 watts of electricity and that we want to know the KWh after it’s been running 10 minutes. 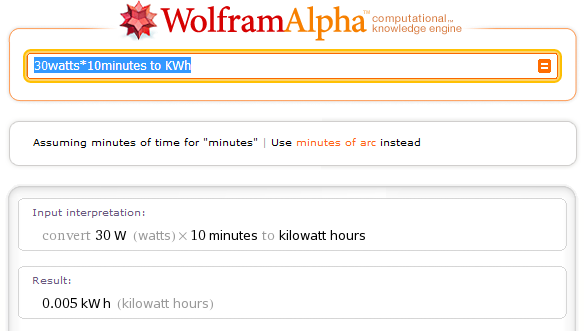 Enter: 30watts*10minutes to KWh in the WolframAlpha search box and you’ll get your answer. Easy enough. So How Much does My Device Cost? You may be surprised at the answers here. In most cases the devices and appliances my family uses are much more energy efficient and cost pennies to operate. 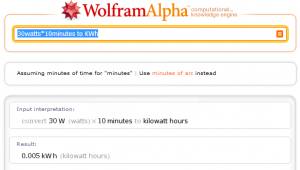 Calculating your own costs is simple enough, multiply your KWh times your KWh rate. Check your power company bill and there should be a listing of your KWh cost. With Puget Sound Energy my provider I get two prices depending on use. The first 600 Kilowatt Hours are billed at $0.084772 and after that they are billed at $0.102851 per KWh. It’s in my best interest to try and keep my usage under the 600 Kilowatt Hours which might be trick since my standard usage is about 1000 KWh a month. I understand volumes of data has been published on energy consumption, conservation and the like. All you need to do is read the back of your electricity bill for some more information but for me actually monitoring my devices was an eye opener. The device is relatively inexpensive at about $20 and with some simple changes you can bring down your electric bill drastically. Some eye opening information was taking a look at the power saver modes of various devices versus their “full” modes for instance with our wireless printer and the difference was 1 watt. Don’t be fooled, arm yourself with all the information you can and get saving. I for one will be defrosting and emptying our “free” Gibson Freezer we got a couple of months ago. Wasn’t the brand of supercomputer in Hackers a Gibson? Have you checked out the TED? The Energy Detective. Steve @GetOutOfDebtGuy swears by it. It’s only a matter of time before I join the ranks of TED Watt Killers! I love my 25 year old, large chest freezer (15 cubic feet). A modern 15 cu.ft. chest freezer I saw in Costco was rated for only about 1 kWh/day. I think the light bulb cost is a bit misleading. It seems that you’re assuming the light is on 24/7/375, which is unlikely. That’s (.08/16.67) = .0048 cost per hour for the bulb – or (.10/16.67) = .006 if you’re beyond the 600 kwh theshhold. Let’s split the different and say a kwh cost of .0055. A typical bulb in my house might get 4 hours of use per day, on average. 4 hours X 30 days = 120 hours per month. 120 X .0066 = 66 cents to power that bulb during the month. .-= Kosmo @ The Casual Observer´s last blog ..Beth Page, Black Widow =-. Just checked out your site and I must say I am very impressed and will be a frequent visitor. I just wanted point you to SmartHomeUSA they have a power strip that will turn off appliances (like the printer and other items) when the computer is asleep or turned off.